Caribbean Stud Poker. Video Poker. TEXAS HOLD EM ! Texas Hold Em. Black Jack. Power: TV plus 4 - AA's / 4 x 1.5V (NOT Included). Take it Anywhere! 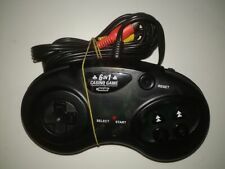 Connects RCA Ports with the Cables INCLUDED! NOS from 2004. Requires 4 AA batteries which are not included. Item #3426. This item will be sold "as-is" in used condition. Fun way to play poker with friends and family. Original box from smoke free home. Box is damaged but unit is in great condition. Batteries not included. 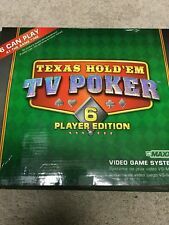 Vs Maxx Texas Hold'em TV Poker .. 6 Player Action in Original Box! Complete working Texas Hold 'em 6 player edition by VS Maxx. Lots of fun! I want you to be happy! HAS WEAR AND SCRATCHES . IN GOOD CONDITION~. Old school graphics works good see pics. 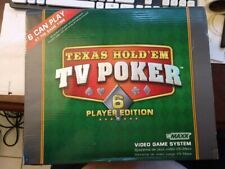 NEW VS MAXX TEXAS HOLD EM TV POKER 6 PLAYER EDITION! Used remote in good working order. What is pictured is the lot you will be receiving. This is being sold as is. LEARN HOW to PLAY TEXAS HOLD' EM.TEXAS Hold 'Em Poker for 6 players or single. Plug into any TV and play right away. Uses 4 AA batteries or you can get an adaptor. Single player mode.Great for learning and practice. Make Supersized Seem Small. this unit is a plug and play unit. 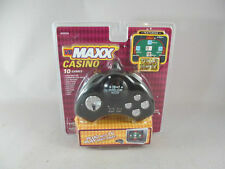 Texas Hold'em TV Poker 6 Player Edition (VS MAXX Video Game System). Condition is New. Shipped with USPS Priority Mail. You get the exact item pictured. 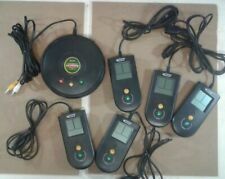 It works great and is in good condition. Payment is due in 48 hours. Thank you for your consideration! VS MAXX TEXAS HOLD EM TV POKER 6 PLAYER EDITION! A fun 6 player video poker. Just hook it up to your tv and you'll have hours of fun at your next poker party.